Yellow is a happy color, browns are somewhat drab, gray, pink, hotels rooms come in many colors. Mine here in the Hotel le Crillon is yellow, and happy. I am not sure if good or bad, however it feels better than the others do. I am paying 6500 CFA for the fan room with a toilet inside. It is amazing for one dollar more how much better the room feels than the Babo and 3500 less than the Concorde. I am finding, I will look at many room because I know, none of the have any White Man in them. Therefore, who is sitting around, the receptionist, the person taking me to the room to check out before I rent, all make the difference to me, whether I rent or pass. The Babo was filling out my sheet, I finally go tired of waiting, my instincts kicked in and I left for much better hotels. Feel, sense, how I live is important, to spend one dollar more is small money in comparison to how much money I would spend indirectly to maybe make myself happy. Behind the wall in front of the hotel is about 10 chair whereby a person can sit and not have to be in their room. I recommend this type of hotel as a good way for learning about a country. 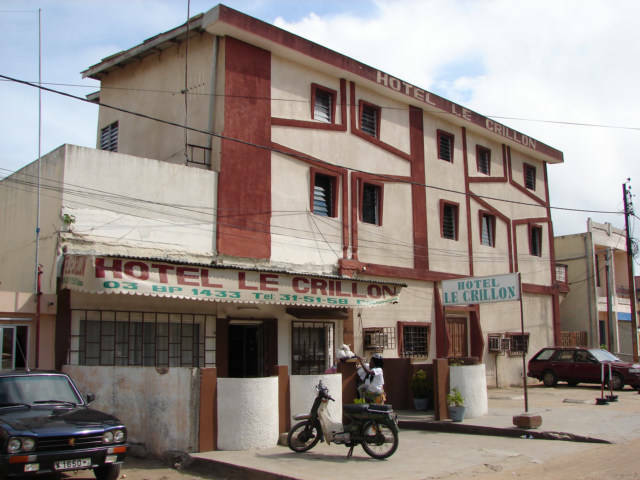 The Moto or Zims make it easy to check out rooms, they motorcycle taxis are everywhere, the people of Benin seem to read ten times better than the prior countries Cote D-Ivoire, Ghana, Togo, thus I can point at the name and they will bring me to the hotel. It is about 200 Franc maximum to jump around in the main hotel area for backpackers. The internet is just across the street, says they will let me connect my computer, and life is good.